Love unicorns? Then you are in the right place! 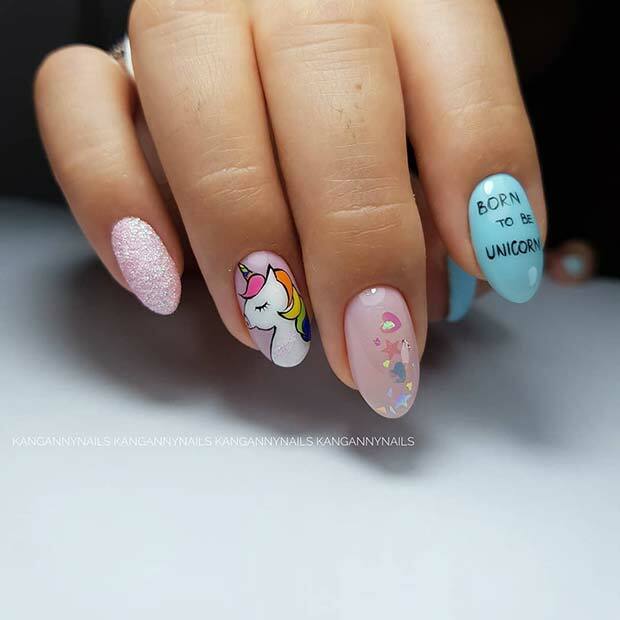 We have found 10 of the best unicorn nails. 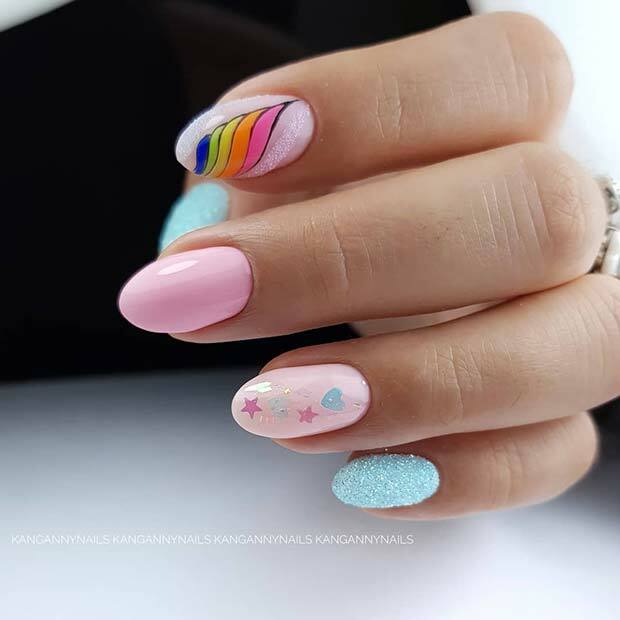 There are so many different ideas, from beautiful unicorn horn designs to manicures with colors inspired by the magical creatures. There is something to suit every nail shape and length. Take a look to see how to bring some magic and style to your nails. The first nail idea we have to share with you is this ‘Born To Be A Unicorn’ nail art design! One nail is shimmering pink, the next has hearts and stars, another has a beautiful unicorn and the last nail has the message born to be a unicorn. These nails are super cute and you can recreate the whole look or maybe try just a couple. Jelly nails have been a big trend this year. These jelly nails have had magical unicorn inspired makeover. 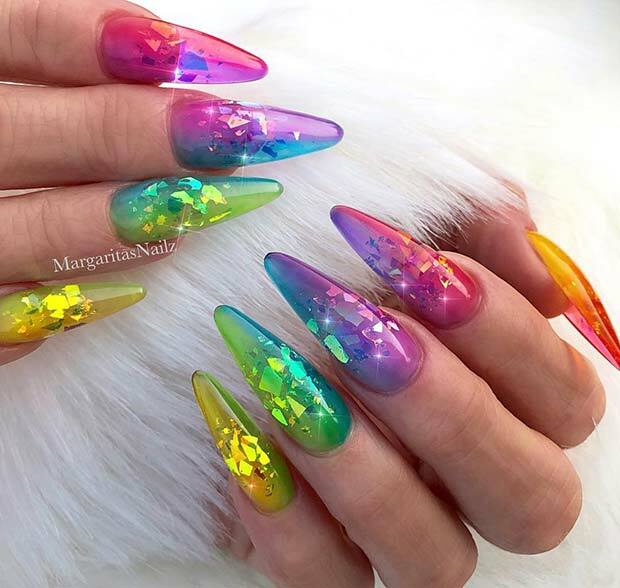 The nails have two colors on each to create a rainbow and there are also shimmering, iridescent shards underneath the color. These are statement making and stunning! You can also recreate something like this with a unicorn horn accent nail too. Our next idea features a unicorn and dream catcher combo. Some of the nails have colorful dream catchers, while some have unicorn faces. There are also some pretty drip nails too. We love these sparkly, magical nails because they will suit anyone. Use this image as inspiration and create a similar look or use your own favorite colors. You can create so many beautiful manicures by using a unicorn horn accent nail. Here we have a super cute example. 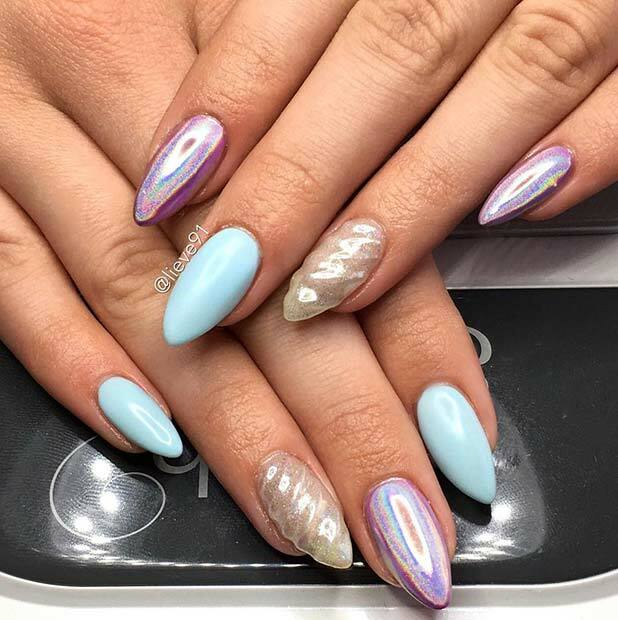 Some of the nails are a light blue, some are a light purple metallic chrome and finally you have the shimmering unicorn horn. You can recreate this look or use different colors and art with a unicorn horn of your choice. Bring glitz, glam and magic to your nails with our next idea. 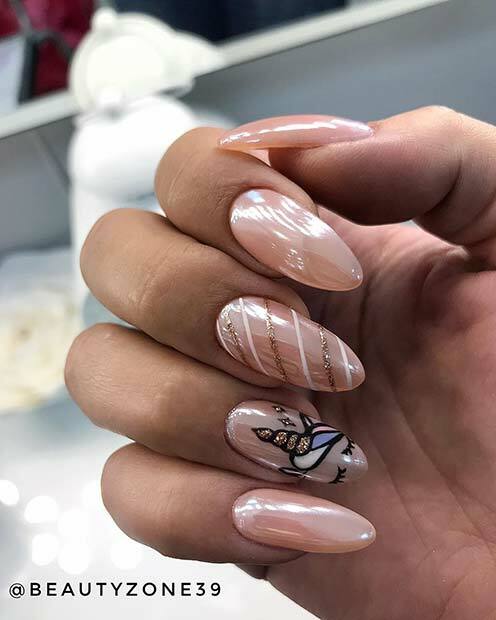 The nails are an elegant light color with two accent nails. One accent nail has glitter and white stripes and the other nail has a sparkling unicorn. These nails are so cute and will suit any nail length and shape. 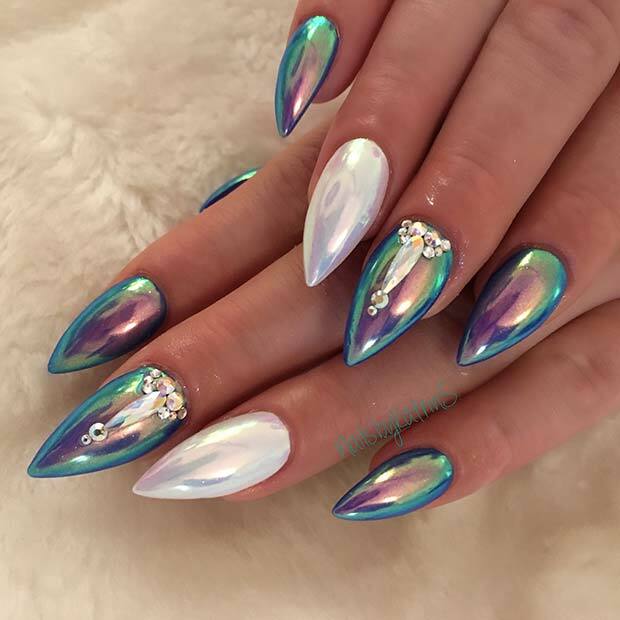 Chrome can be used to create gorgeous unicorn nails. Don’t just take our word for it, check out this manicure! The nails are a purple and blue tone chrome with a bright white chrome accent nail. There are also some added gems that really jazz up the finished look. Recreate with similar colors and gems or use different magical colors to create your own unique design. 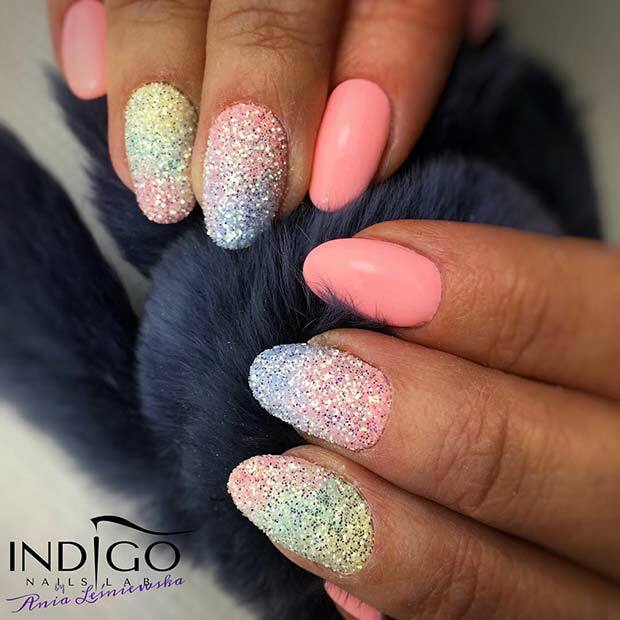 Pastel colors are perfect for creating unicorn inspired nails and our next idea is a beautiful example. Most of the nails are a light pink with two accent nails. The accent nails use pretty pastels and glitter to create a rainbow effect. Recreate something like this or add a unicorn horn accent nail. A white horn would suit this look perfectly. Next, we have an idea that features nail art inspired by a unicorn mane. The nails are a light pink with a pastel blue shimmering accent nail. On one of the nails, there are beautiful hearts and stars while on the other is a rainbow unicorn design. This is a super cute and pretty manicure that will suit everyone. Looking for cute and vibrant nails? Then this idea is perfect for you. The nails are pink and purple with two white accent nails. One of the accent nails reads “I’m a unicorn” while the other has a pretty unicorn design with stars. Have a go at creating this look or change the colors to suit your own style. 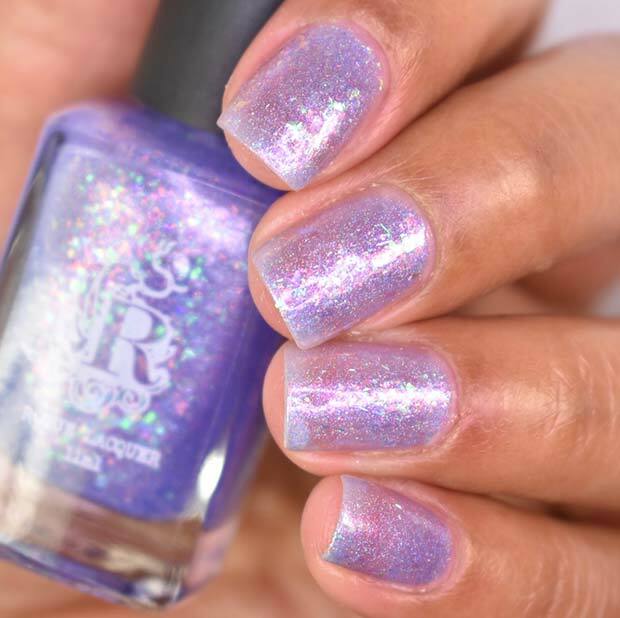 You don’t have to go over the top with your unicorn nails, maybe try a pretty and shimmery look like this one. The shorter nails have been painted in a light sparkling purple. This is a simple but magical look. Nail colors like this one will suit everyone and it will look beautiful on any nail length and shape.